The cervical plexus is located on levator scapulae and scalenus medius muscles deep to prevertebral fascia, internal jugular vein and sternocleidomastoid. The cervical plexus supplies skin and muscles of the neck and the thoracoabdominal diaphragm. Its branches are ordered into superficial and deep groups. Great auricular nerve (C2, C3). Transverse (anterior) cervical nerve (C2, C3). Gray rami communicantes from superior cervical sympathetic ganglion to all the 4 roots. 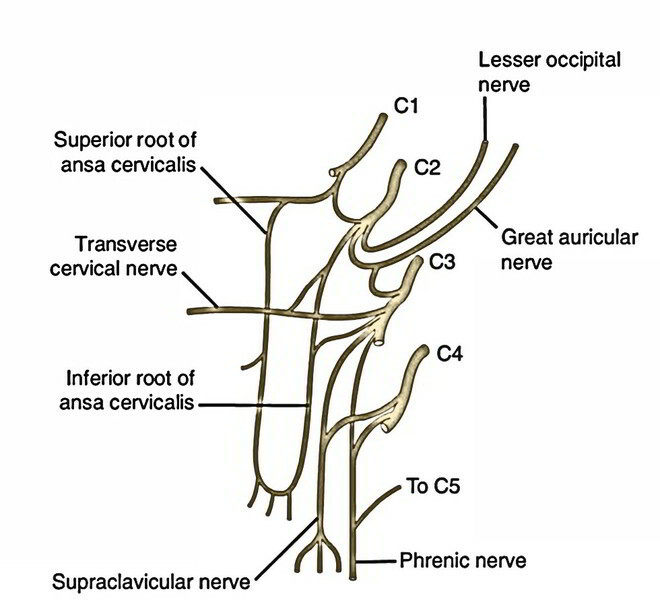 A branch of C1 joins the hypoglossal nerve. A branch from C2 to sternocleidomastoid and branches from C3 C4 to trapezius convey with spinal accessory nerve. Rectus capitis lateralis (C1, C2).